Valentine's Day To-Go! - San Diego Dining Dish! This year, like every other year for Valentine's, Steve and I will be cooking for ourselves. However, new parents in particular might find that these take-out options to fit every taste! Find the fusion of love at Wang’s North Park. This Asian fusion hot spot can cater to all your tastes whether it is spicy, sweet, savory or all of the above. Start off the romantic Valentine’s Day at home with ahi sashimi prepared with fresh mint, serrano chili, on a Persian cucumber with a candied ginger mirin reduction. Heat things up a bit with the Fire Island fish, a fish fillet with garlic, ginger, black beans and crispy leeks. Don’t forget noodles for a romantic moment a la the Lady and the Tramp. If roses are red, violets are blue and you love meat, order from Brazen BBQ. Southern style barbecue with a twist, this Hillcrest restaurant takes classics to the next level. Get saucy with Brazen’s baby back ribs or Lone Star Texas brisket topped with their award-winning sauces. Don’t forget homemade sides like the crusty macaroni & cheese and cornbread for an extra dose of comfort. End dinner at home on a sweet and meaty note with Brazen’s pig candy brownie, a rich bacon-infused chocolate brownie. Order dinner to go from either Fig Tree Café’s Liberty Station or Hillcrest locations and surprise your Valentine with their dinner dishes in the comfort of your home. Sink your teeth into the braised short rib flatbread with mozzarella, rosemary potatoes and topped with a horseradish crème fraiche before digging into the main course of Fig Tree’s juicy jidori chicken served with a sauvignon blanc sauce, fingerling potatoes and grilled asparagus. Don’t forget nutella filled donuts coated in sugar for a chocolatey end to the night. Valentine’s Day dinner isn’t complete without incredible desserts. Le Parfait Paris creates exquisite pastries and cakes. Order their classic macarons in a variety of flavors or other favorite treats like the Bavarois to enjoy in the privacy of home. 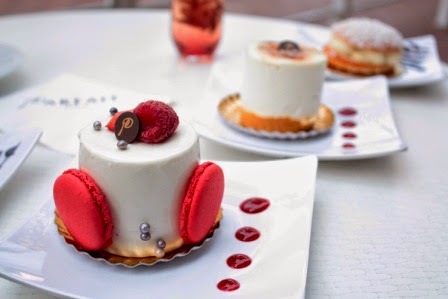 A popular dessert in France, the Bavarois is a delicious almond biscuit, layered with a Madagascar vanilla mousse and a fine layer of natural berries. It offers a subtle mix of light and fruity taste, the perfect treat to end Valentine’s Day.